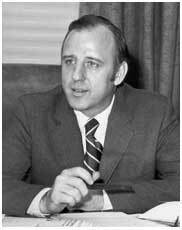 When The City Club held its first meeting, September 15, 1975, former Senator Charles E. Goodell, Republican of New York, then United States Clemency Commissioner, was our speaker. There have been more than one thousand programs since, an extraordinary list of who’s who in American politics, government, business, journalism, science, religion, arts and letters, but The City Club could not have had a more auspicious beginning. Having had the honor of serving as the senator’s press secretary, and as founder of The City Club, I assure you this was a special moment in my life – for I loved and admired greatly Charles Goodell. Not long ago I wrote a tribute to the Senator’s life and memory. I fully intended to post it on The City Club’s Web site, but did not. Why? 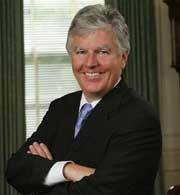 Because Marty Meehan, Chancellor of the University of Massachusetts, Lowell, a former member of the United States House of Representatives, in nominating Senator Goodell posthumously for a Doctorate of Humane Letters, wrote something superior to my efforts. So it is his tribute rather than mine that is posted below. Chancellor Meehan believes Senator Goodell deserves far more than a footnote in American political history. Perhaps the Chancellor’s admirable undertaking will cause others to focus on what a truly extraordinary public servant was Charles E. Goodell. On Saturday, May 29, 2010, at the University of Massachusetts’ commencement in Lowell, Senator Goodell will receive posthumously the Doctor of Humane Letters degree. The Senator’s family and former staff members will be present for that occasion of remembrance of things past – and the privilege and honor that was ours to have been associated with such a lovely and courageous man, who embodied what is best and noblest in American politics and government. United States Senator Charles Ellsworth Goodell, Republican of New York, was a progressive in a time of conservatism and an advocate for change in a party of austerity. Senator Goodell knew that freedom and righteousness cannot be measured by public opinion polls, shaped by political consultants, or preserved in backroom bargaining. Rather, they reflect a higher calling to core principles of humanity that transcend all boundaries of nationality, race, and ideology. Indeed, as revealed through Senator Goodell’s career choices, these ideals are not what make us uniquely American; they are what make us uniquely human. With unflinching resolve in the face of incalculable professional cost, Senator Goodell championed these ideals in opposing the Vietnam War during his congressional tenure from 1959 to 1971. Although his “unfaithfulness” to President Richard M. Nixon cast him politically adrift, he maintained his positions because they were the right positions. Unlike many politicians of his time, Senator Goodell also shunned political expedience and personal aggrandizement. In that same vein, while others feigned valor through wrathful speeches, bombastic rhetoric, and reflexive loyalty, Senator Goodell exhibited a calm reticence and healthy skepticism towards superficially-appealing, but substantively-dubious initiatives, such as deployment of the Safeguard Anti-Ballistic Missile Defense System and passage of the 1969 Military Procurement Bill and the Military Appropriations Act of 1970. Senator Goodell’s convictions extended beyond opposition to popular, but imprudent policies. As a member of the U.S. House of Representatives from 1959 to 1968, he passionately advocated for the powerless, including those discriminated on the basis of their race, ethnicity, or gender in the workplace and private housing markets. Imbued with an unrivaled resolve for ensuring fairness, Goodell authored several pieces of legislation intended to promote situational justice. Perhaps most significantly, he co-authored the Equal Pay for Women Act of 1963, which requires that men and women earn equal pay for equal work in similar jobs. It remains a landmark piece of socially-progressive legislation. Although sometimes not in agreement with Goodell’s positions, fellow Republican members of the House respected his thoughtfulness and sophistication, and appointed him chairman of the House Republican Committee on Planning and Research in 1965. Goodell’s distinguished record as a member of the House of Representatives illuminates why Governor Nelson Rockefeller appointed him to replace Senator Robert Francis Kennedy in the Senate. After all, he could have appointed any number of more prominent New Yorkers. Instead, he turned to a member of the House from western New York who, while deeply respected by colleagues, was far from a household name. Little known, but acknowledged by the Governor and his staff in making this momentous and unexpected decision, was a lengthy and meticulous comparison of the Goodell and Kennedy records, which demonstrated that they agreed on the fundamental issues of their times. Following in those inimitable footsteps of Senator Kennedy, Senator Goodell was most deeply affected by the Vietnam War during his senate tenure. His discontent with the spiraling and seemingly aimless conflict contrasted with lessons learned from his own military experience. Indeed, like President John Fitzgerald Kennedy, Senator Goodell understood the meaning of freedom after serving in the Navy in World War II. He also served in the Korean War as a lieutenant in the U.S. Air Force. And like both President Kennedy and Senator Kennedy, Senator Goodell came to deeply believe that human suffering and justice cannot coexist. For that reason, he offered several key pieces of legislation designed to bring an earlier and more peaceful end to the Vietnam War. Most notably, in 1969, he introduced The Vietnam Disengagement Act, the first congressional bill requiring the withdrawal of all American military personnel from Vietnam. Had it become law, the Act would have called for the safe withdrawal of military personnel by December 31, 1970 and for humanitarian assistance to the South Vietnamese people. Of similar effect, Senator Goodell, along with Senators George McGovern, Mark Hatfield, Alan Cranston, and Harold Hughes, co-authored The Amendment to End the War in 1969. Although we will never know how many lives, American and Vietnamese, could have been saved by a withdrawal from Vietnam in 1970, we do know that many perished or suffered terribly thereafter. Senator Goodell’s passion for humanity extended beyond those mired in the Vietnam War. Indeed, as thousands of Biafran children lay starving and dying during the Nigeria-Biafra Civil War, Senator Goodell stood up to the stubborn intransigence of the U.S. Department of State and rallied Americans to provide tons of medicine, food, and clothing to the landlocked, secessionist territory of Biafra. Single-handedly he (1) sponsored the Biafra Christmas Ship in the Port of New York; (2) organized a Biafra Christmas Ship Rally on the front steps of St. Patrick’s Cathedral, which attracted Terence Cardinal Cooke, New York City Mayor John Lindsey, U.S. Senator Jacob Javits, Henry Kissinger, and the First Lady of the United States; (3) led a Study Mission to Nigeria and Biafra to study the nature and extent of the starvation and malnutrition problem; (4) reported his findings to the President, who set up a special White House Office on Biafra; and (5) addressed the National Press Club on the conditions he found there, including vials of poisoned food. The New York Times chronicled all of these efforts, often on the front page.